Everyone has an amazing story, something to offer to the table and it’s always a breath of fresh air for me to listen to them. Not in a sticky nose way, don’t get me wrong here. Its more, I really love hearing about the big moments in people’s lives just as much as the small ones. I love knowing what makes people tick, what makes them love and hate. It makes me think past myself and really opens my eyes to the fact there is always so much more going on outside our own little bubbles. In life generally, we pick people who are similar to us and who we share things in common with. But I really enjoy hearing about things I myself may not actually experience or have yet to experience. Working with people has always been such a strong passion of mine, from my counselling days and now finding myself within the Life Coaching world, I can’t get enough. To listen to people, and their stories, to know where they have come from, to where they are now and to have a hand in assisting them to move forward, to live their life completely and live it with passion and worth and truth. It lights me UP. 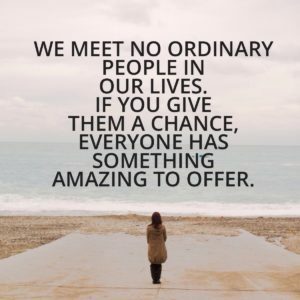 There are NO ordinary people. Everyone has a story, a tale of the past, a want for the future. Just stop and take a moment to expand your own horizons and chat with someone you wouldn’t normally. You will truly be surprised with what you find.